A quick update for all our readers – Cristina and I (Atif) will be in beautiful Gainesville, Florida this week for the National Association of Science Writers/Council for the Advancement of Science Writers annual conference! I will be speaking on a panel on Saturday November 2nd titled “Take a lesson from the universe: Expand” in the Dogwood room at 11am. I’m excited to be speaking on this panel, along with some of my favourite science communicators in Alan Boyle, Joe Hanson, Matt Shipman and Kirsten “Dr Kiki” Sanford. Thanks also to Clinton Colmenares for organizing this wonderful opportunity and what promises to be an excellent discussion. Scientists know science. And they’re good at getting science news. Know who’s not? Non-scientists. Yet non-scientists outnumber scientists, and their attitudes, believes, intellects (or not) and their votes help determine science policies, from funding for stem cells to what’s taught in school. The near-extinction of science reporters at local news outlets has created a gap in a steady stream of legitimate, dependable science news. Yet today there are more ways than ever to reach the general public. This session is about expanding your audience beyond the science in crowd. We’ll talk with two young scientists who are passionate about finding new ways to reach new audiences and we’ll explore ideas for how PIOs, freelancers, staff reporters and even scientists themselves can take a lesson from the universe and expand. If you see either of us around, be sure to say hi! We’ll be at most of the events, and would love to meet you! Anyone who follows my writing knows that I’m a big proponent of using stories to talk about science. We’ve discussed how you can use science fiction teach science, zombies to talk about disease outbreaks, and my TEDx talk discussed using principles of storytelling in how we discuss science. 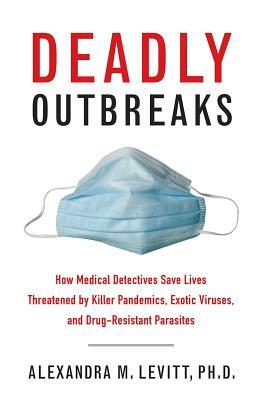 So when I was asked to review (see disclaimer below) Dr Alexandra Levitt’s new book “Deadly Outbreaks: How Medical Detectives Save Lives Threatened by Killer Pandemics, Exotic Viruses and Drug-Resistant Parasites,” I jumped on the opportunity. The CDC has a program known as the Epidemiologic Intelligence Services, where individuals trained in fields such as epidemiology, medicine, statistics and veterinary sciences come together to identify causes of diseases. For an overview of the EIS, check out this review of “Inside the Outbreaks” by Travis Saunders over at Obesity Panacea. The EIS was set up Alexander Langmuir, who has been profiled on the blog, and their work has been instrumental in learning about, and thus containing, disease outbreaks all over the world. Dr Levitt is well positioned to speak on these issues, having worked at the CDC since 1995, although it should be noted that this was written in her free time, not as part of her position at the CDC. You’ve spent the last month working on a manuscript/paper, have fleshed out your ideas, spent countless late nights editing and making things sound *just* right, and you’ve finally sent it in to your supervisor. This will be the draft. This will be the one that they read and go “Wow! Good job! Submit this to Nature immediately!” And it’ll be accepted within a week, and you’ll be flown to Washington to present the paper to President Barack Obama himself, and, while you’re there, BB King will show up and you’ll jam together in the oval office, and, just when you think you’re about to finish your Epic Blues Jam Session, Bill Clinton will come by and play the saxophone. But then, your supervisor sends you your paper back, and it’s either covered in red ink or there are 714 comments in Microsoft’s Track Changes. This is *literally* the most appropriate GIF I could find. One of the major reasons you’re in grad school is to learn from these experiences. There is a reason your supervisor is the Canada Research Chair of Awesomeness, or is internationally known for their work. It’s because they’re very good at what they do, and part of what they do is write, and write well. Your goal is to learn everything you can from them, and in that process, improve your skills. And writing is just one part of this process – your ideas will need refinement, your writing will need work, your teaching will need improvement, all of these are skills you can work on during your graduate education. However, in order to improve, you need to deal with feedback, which can come from a wide range of sources including your supervisor, your students (via TA/TF evaluations) and people at conferences. Don’t react defensively – or aggressively – no matter how hurt, disappointed, or annoyed you feel. Start by taking a deep breath and reminding yourself of your goal. 2: Remove emotion from the equation. As silly as it sounds, you do get emotionally attached to your writing over time. You’ve spent countless hours tweaking everything, making it sound *just right* before sending it in. You’ve read and reread sentences again and again to make sure they’re clear. Your supervisor then rewrites many of those sentences, and may suggest that some are unclear and need work. At a conference, someone might be less diplomatic, and call your work all kinds of names. You need to take emotion out of the equation as you hear those comments, and decide what comments have merit and require further thought. One thing you should not do is take criticism of you to be a personal attack. Negative feedback isn’t personal. By removing any emotional responses from the comments, you can evaluate comments on their own merit, and decide how to deal with them. This may be extreme, but you get the idea. In an emergency room, patients are triaged. Those with life-threatening conditions are identified as high priorities, while those who do not need immediate attention will be waiting for beds to open up. Similarly, you need to identify which comments are important, and need to be addressed immediately, and which are stylistic and you can let slide. Pick your battles. We’re now thinking of comments outside of those that your supervisor would give you – we’re into the realm of feedback from students, audience members at presentations, and others. Listen to the comments, and understand why the feedback is being given and what you can do to improve. What you really need to do here is identify what is constructive and helpful, and where the comment is coming from so you know how to fix it. Use the comments to help you, and be objective about whether or not it is useful – even if you don’t like the comment. One of the best pieces of advice I got as a Masters student was to listen to all comments and evaluate them all, even the ones you don’t agree with, but to always ignore personal attacks. And you will get personal attacks – students will write mean comments in TA evaluations, people will attack you at conferences, and, especially if you put your ideas out on the internet, you will get called all kinds of names. It’s very easy to dwell on those comments: don’t. You know you’re good at what you do, and don’t let anyone tell you otherwise. This GIF always makes me laugh. I don’t know why. And thus we get to the final point: don’t listen to everyone. Everyone will have advice, everyone will have an opinion. Take the points that you like, synthesize them, and use your own judgement to decide what works for you and fits your project/worldview (that includes this article). Don’t accept everything blindly. Decide what you stand for, and if someone is arguing with you about it, plant your feet firmly and don’t budge. This was originally published on Gradifying.